It has come to our attention that a substantial number of people are submitting their original tangible material about Bachelors Grove via postal mail as well as in-person to certain individuals. At times none of the material is being returned to them as per agreement with the recipient. 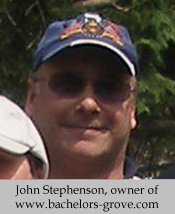 Since the early part of 2009, all of the unpleasant testimonials thus far to support these allegations have lead to perpetrator John Stephenson, whom is the owner of www.bachelors-grove.com and www.bachelors-grove.net, is known as Ghost1 on the forum of said websites, and whom is not the owner nor affiliated with the Bachelors Grove Cemetery & Settlement Research Center located at www.bachelorsgrove.com as many have suggested. In only one instance can the Bachelors Grove Cemetery & Settlement Recreational Center vouch for the validity to such an action by John Stephenson. Information about the incident was kept quiet in order to keep the peace due to other incidents in the past. Because of the amount of feedback by the public concerning the allegations of theft and the misconception as to who owns and runs these Bachelors Grove websites we are now compelled to make this public statement. The Bachelors Grove Cemetery & Settlement Research Center has always been open to receiving material via e-mail, as well as receiving and returning material via postal mail and in-person since 2000 and we hope that the actions and/or allegations of others does not reflect upon the reputation of honest individuals and organizations. We are truly concerned by the allegations of theft that are occurring and the Bachelors Grove Cemetery & Settlement Research Center looks forward to many more years of public service and keeping the activities fun for everyone. If you or someone you know has also become a victim of such theft by any individual or organization feel free to contact us in order to arrange for an interview.